On Sale Now! Free Shipping Included! Save 4% on the Stanley 16-791 Sweetheart 750 Series Socket Chisel Set, Brown, 4 - Piece by Stanley at In The National Interest. MPN: 16-791. Hurry! Limited time offer. Offer valid only while supplies last. Introducing the Sweet Heart 750 Series of socket chisels. Once again, Stanley has reached backwards to move forward and reconnect with woodworkers! Introducing the Sweet Heart 750 Series of socket chisels. Once again, Stanley has reached backwards to move forward and reconnect with woodworkers! Tool steel blades forged in the U.K. with genuine hornbeam handles. 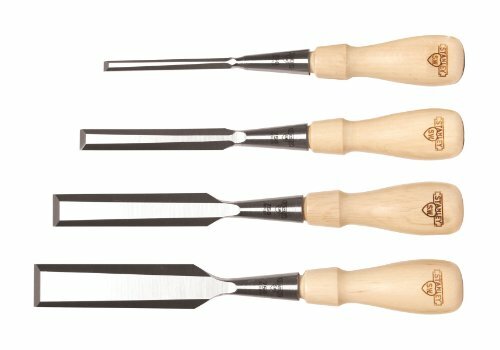 Delicate looking, well balanced and every bit genuine hardworking chisels! Individually boxed. Handle require setting prior to use. Set includes 1/4a€, 1/2a€, 3/4a€ and 1a€ with a genuine leather tool roll.